R. Todd Ehle, known as professorV on Youtube, is an Associate Professor of Violin at Del Mar College, a junior college in Corpus Christi, Texas, where he has taught since 1999. Before coming to Corpus Christi, Todd spent five years as an instructor at the Wausau Conservatory of Music, a community music school in Wausau, Wisconsin. Todd has worked with students of all ages and abilities at these two institutions. 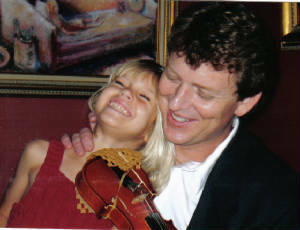 Todd began violin studies in 1973 as a Suzuki violin student, under the tutelage of Judy Atkinson. Two years later, Todd became a 'traditional' student, working with Patsy Zick, and spent the next eleven years as her student. Upon graduation from high school, Todd attended the University of Northern Colorado where he was a pupil of Professor Richard Fuchs. Fuchs, a wonderful musician and teacher, is a former student of the great violin pedagogue, Paul Rolland (1911-1977). Rolland, author of The Teaching of Action in String Playing, was well-known as a pedagogue that paid specific attention to fundamentals. Rolland was a founder of The American String Teacher's Association and the first editor of its journal, American String Teacher. After graduation from Northern Colorado, Todd attended the Eastman School of Music, studying with Catherine Tait. Tait was a former student of Ivan Galamian and Jamie Laredo. Todd only spent one semester working with Ms. Tait, but learned the Tchaikovsky Violin Concerto with her and continues using her abbreviated version of Ivan Galamian's scale system to this day. Ms. Tait died of Breast Cancer in 1993. Todd was also a long-time student of both Harold Wippler (former concertmaster of the Denver Symphony, and teacher of Eugene Fodor) and Ernest Papavasilion (former member of the Metropolitan Opera Orchestra who died in 1990). He also attended the Meadowmount School of Music, studying with Kevin Lawrence (North Carolina School for the Arts), and the Bowdoin Music Festival, working with Lewis Kaplan (Juilliard, Mannes). Todd spent four months studying Suzuki Method pedagogy with William Starr in Boulder, Colorado. Mr. Starr was one of the original pioneers in the Suzuki world. He became the first president of the Suzuki Association of the Americas in 1972. Todd continued his Suzuki pedagogy studies, spending a year with Margery Aber, founder of the American Suzuki Institute, in Stevens Point Wisconsin. 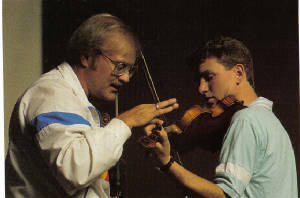 Richard Fuchs working with Todd in 1986.